Using RAID 1 transparently (without any driver) to protect your data from hardware failures. The solution is the Kingwin HDCV-2 adapter. 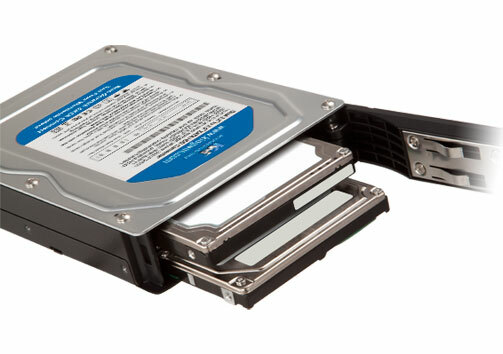 It holds two 2.5" SATA drives inside an enclosure made to match the shape and size of a regular 3.5" SATA drive. Simply insert two identical 2.5" drives inside and install the enclosure like you would any 3.5" drive. They will appear as a single drive in MediaToolbox which can be partitioned and formated as usual. RAID 1 provides live mirroring of the drive, which could contain the OS, applications and data. The main benefit it provides is to allow continuing booting and using the computer normally in case one of the hard drive dies. Without mirroring, if the main drive fails, to get back were you left off, you would have to obtain and install a new drive, boot from a CD or another drive and then restore a backup to it. For most people, there's a good chance the backups will be weeks if not months old, missing all the recent data added and changes made since the last backup. With a RAID 1 mirror you can continue what you are doing and worry later about replacing the dead drive. Even that part is relatively painless, other than having to turn the machine off to remove one of the drives to find out which one failed, once a replacement drive has been installed, the computer can boot normally while the enclosure automatically starts mirroring the original drive to the new drive. This enclosure is completely transparent to the OS, it doesn't modify the drives RDB nor its formatting at all, so even if the enclosure itself died, it's simply a matter of pulling the drives out and plugging one of them directly into the controller to be back in action until the enclosure can be replaced. Mirroring is great to prevent down-time, but it's not a substitute for regularly making backups. I would recommend setting up some daily automated online backup, e.g. using my port of S3C for Amazon AWS, or any server that gives you access via ssh/scp. 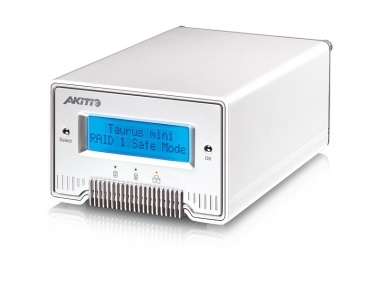 Should your online storage or internet access go down, it's also a good idea to make local backups on a portable RAID drive, such as Akitio's USB3/eSATA Taurus Mini Super-S3 LCM.